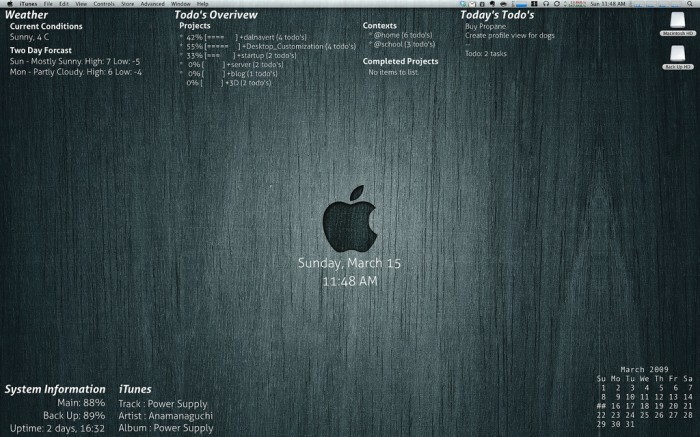 I got inspired by Lifehacker posts about both GeekTool and todo.txt and decided to start using it myself. I found that outputting the whole todo.txt to the desktop became a bit messy. I also wanted to display other info like weather, system info and iTunes info, and the to-do list was taking up too much room and was hard to make “look good.” My solution is pretty simple. I still have my major todo.txt and then another file @today.txt which I set up each night or morning and fill it with stuff that I must get done the next/that day. This makes the whole process of actually doing to-do’s easier instead of just creating them and hiding from them/being overwhelmed. This also produced a very trimmed-down list which didn’t clutter up my desktop with a ton of text. I used birdseye.py and modified the scripts(along with your todo.sh) so that they would display in the ways I wanted. 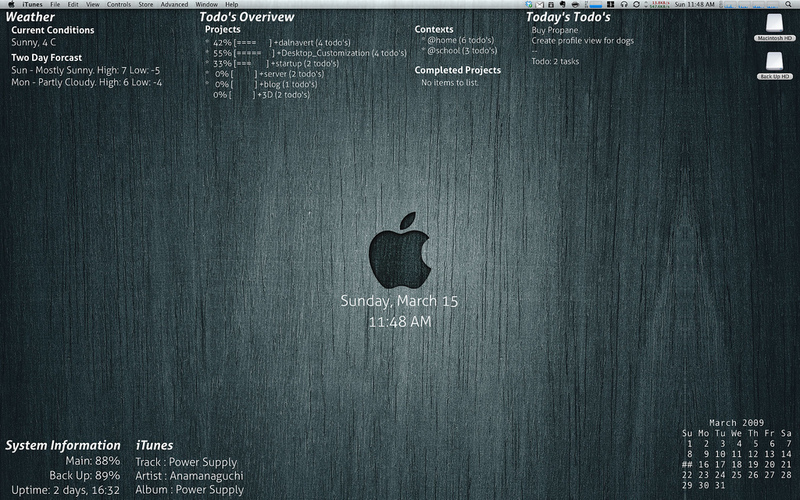 Not only did I want the information to be displayed on the desktop but I also wanted it to look good. The font used is weight variations of Aller and Aller display except for the calendar in the bottom right as I needed a monospaced font for this so it all lines up. Before embarking on this project I knew nothing of the command line and Terminal or shell scripts, and coming out the other end I learned a ton. Nice job, Grant. If you want to learn more about setting up GeekTool on your Mac, check out my full writeup, Monitor your Mac and more with GeekTool. To get the calendar Grant and I am using, here’s the command you need. Very nice. Love that background image – could we get a link?